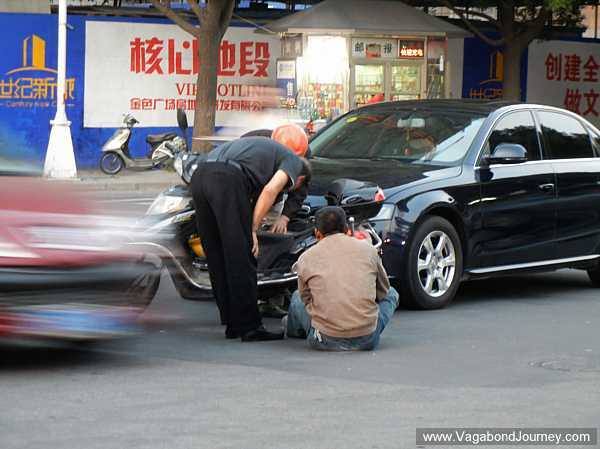 E-bike accidents are incredibly common in China, even though most cities are lined with special lanes for bikes and, ultimately, provide a relatively safe riding experience. Published on April 5, 2013 by Wade Shepard Follow me on Twitter here. There she laid, in the middle of the street, sprawled out, with a tibia that appeared to be snapped in two. I thought she was dead at first, but after detecting a slight rising and lowering of her chest it was clear that she was just knocked unconscious. From the position of the taxi cab and her e-bike it was clear that she drove out into oncoming traffic and was creamed. The taxi driver was pissed, he was screaming into his cellphone, a group of onlookers — including myself — formed a circle around the prostrate woman, and traffic continued to drive around the scene anyway it could. 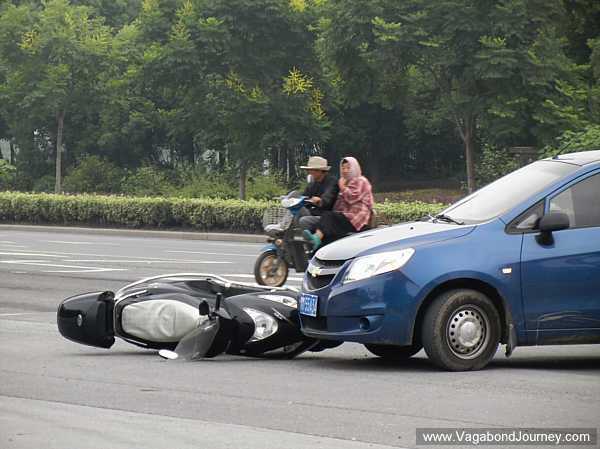 This was normal scene in China, it was yet another e-bike related accident. If you travel around this country you can see these accidents happening with regularity. You see the bashed up bikes laying prone in the middle of a road with a car hovering over them in an askance position; you see people walking through malls with bruises and road burns on their arms, knees, and shoulders; you see busted up e-bike drivers being carted off to hospitals in taxi cabs after crashing. Often, these accidents leave me baffled: how did they not see it coming? Why would they just drive right out in front of a speeding bus/ truck/ car? Why would they drive the wrong way down a highway into oncoming traffic? These accidents are therefore mysteries to me, as they often happen after an e-bike driver acts as though they are immortal. It is absolutely amazing how many times I’ve seen people driving e-bikes come literally within inches of being run over by much larger vehicles seemingly without even knowing what a close call they just had. It is appalling how many times these much larger vehicles actually make contact. 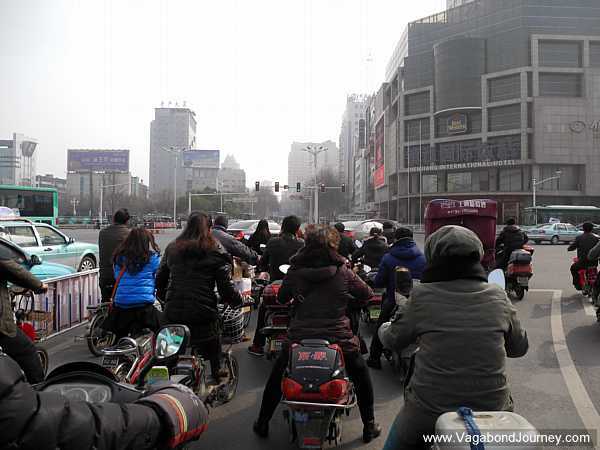 “There are two rules for driving an ebike: 1) never look behind you, and 2) when you make a turn just go out into traffic and don’t stop for anything,” an electric bicycle riding friend in Taizhou explained. Ebikes are driven as though they are bicycles, but they are made to go far faster and the drivers seemingly have less control. Two or three thousand people are killed each year in ebike related accidents across China, and it’s easy to see how this happens: people tend drive them without much regard for mortality. They quickly weave in and out of traffic, crossing between bike lanes, the road, and sidewalks at their discretion. It is common for two or more people to be riding on a single bike –sometimes you even spot entire families packed tightly onto one. Small children are often placed between the legs of the driver — sometimes sitting on a stool placed on the deck — and larger kids are balanced on the back. Nobody wears a helmet. 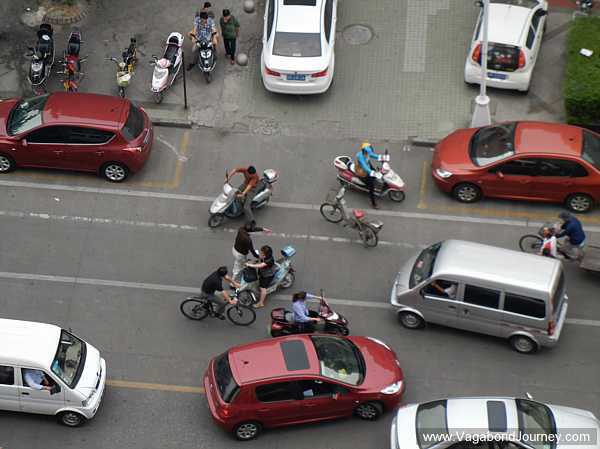 In Chinese cities that have been converted or built to accommodate automobile transportation it is actually relatively safe to drive an e-bike or bicycle. More often than not, there are either fenced off bike lines or very large shoulders on the roads, and just so you follow basic safety precautions — like looking before pulling out in traffic, not driving down the center of the road, and giving much larger vehicles the right of way — the bike transportation systems of China are excellent. The problem is that an incredible amount of people just don’t follow these basic rules. 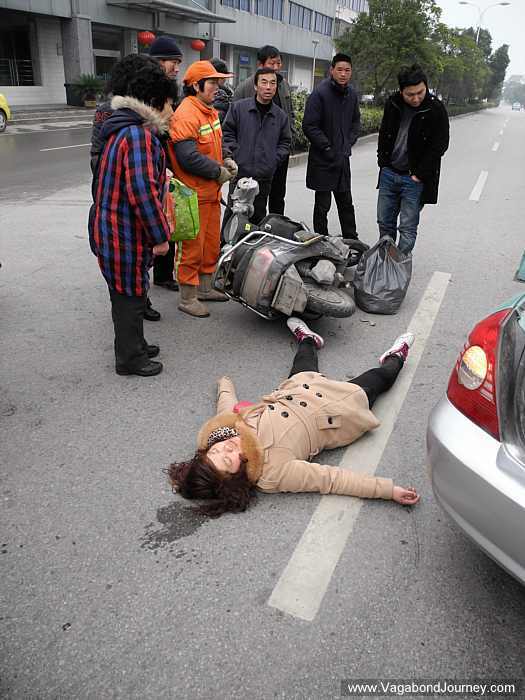 E-bikes are driven madly here, and seeing them laying prone in the middle of the road after being clobbered by a car is one of the sights of China. In my experience, ebike drivers are often some of the least likely drivers to follow traffic rules. The bikes are small and fast enough to cut in and out of traffic with automobiles. Drivers often don’t stop at red lights.